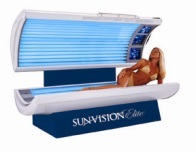 The Sunvision Elite™ series of tanning beds gives you freedom and flexibility like never before. You choose between facials or no facials, body fan or not. The power of the Wolff® system lamps and comfort of the wrap around tunnel design will give your customers the golden glow they love.